Modscape’s eco-friendly homes minimise environmental impact, maximise year-round comfort and reduce running costs. These factors are incredibly appealing to clients looking for houses to live out their dream of a green life in a sustainable house. While the definition of sustainable building design evolves over time, Modscape’s perspective on sustainability is centred around a desire to create eco-friendly homes that are innovative, comfortable, healthy and more environmentally sensitive. In creating our modular homes, sustainable design principles are applied to every aspect of the house design – including thoroughly considered orientation, the material selection, the systems utilised to construct and the operations of the dwelling. A shining example of our eco-friendly off-grid homes is our Winchelsea project. 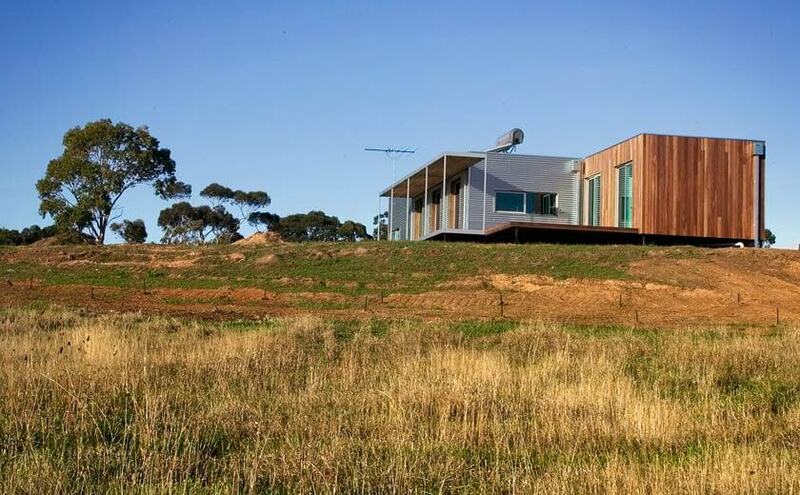 Owners Judy and Graeme were keen to relocate from Geelong to a rural area and had been investigating eco-friendly homes online when they came across Modscape. “One autumn day, when the broad Western Plains views were delivering the full ‘sunlit plains extended’ cliche, a semi-trailer backed down the couple’s driveway and dropped off their living room/kitchen, bedroom and ensuite. A couple of hours later, a second semi delivered the other part of the couple’s new 11-square modular home—an interconnecting module containing an entry foyer, laundry, a main bathroom (with ensuite), an open study and a guest bedroom for the children, grandchildren and out-of-town friends. 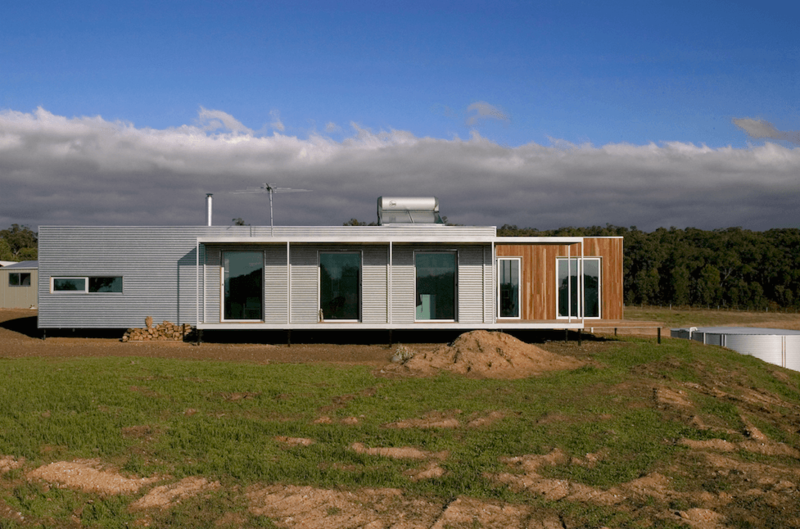 Both fully-fitted-out modules were set down on 14 steel-screw pylons, which made for a very light footprint on the scenically spectacular site located on the border of the Otway Ranges forests and the volcanic plains southwest of Melbourne. While it took the drivers and the five on-site workers only a couple of hours to set down and set up this prefabricated home, it took a couple more days to connect the blackwater and greywater systems. After that, realising this fully-functioning dwelling was simply a case of adding water! As empty-nesters, the clientsdecided to realise their dream of swapping the big, conventional houses in Geelong to live simply and sustainably, with a five-acre permaculture garden, in a friendly rural place with magnificent views and a sense of like-minded community. They opted to go the prefab homes route for the simple reason that the whole region is in the throes of gang-buster development and they couldn’t find a builder interested in doing small eco sustainable houses. “My neighbour couldn’t even get a builder to quote!” recalls Judy. While it took two years of ground-work to secure the right site, it took mere minutes of internet-work to find what they were looking for in prefabricated houses. Want to visit our factory? Get in touch with us today to arrange a visit. Modscape was formed in 2006 by four mates who knew each other, either through university or the commercial construction industry. Collectively, Jan Gyrn, Stefan Seketa, Dan Larkey and Paul Fellows have experience in project management, design and construction that has been honed on large-scale developments. Jan says allof Modscape’s beautiful homesfulfil six-star energy rating criteria as well as rigorous recycling practices. “But to me it seemed ludicrous that domestic brick and terracotta architecture was still not being built with core eco-friendly design principles,” he recalls. Having been born in Japan, where prefabrication is not unusual, and exposed to domestic building practices in Denmark, the United States and Canada “where 20 per cent of the population lives in prefab homes” Jan was fascinated by prefabricated domestic architecture. Its practical side appealed to him, too, as it promised a way of achieving streamlined minimalist and sustainability, all with minimal impact on the environment. After some long discussions, our group decided that just such a pragmatic approach would fill a potential niche in the market and lead the way to a more sustainable future in domestic construction “because anything can be broken down into smaller parts or modules”. If you’d like advice on a project, contact us today and we’ll get back to you within 48 hours. Judy and Graeme became one of Modscape’s many customers to benefit from the process whereby a fully-formed building can be delivered, with all its cross-ventilating windows and internal fittings and fixtures, in just 12 weeks. By early afternoon on the day the parts arrived on site, the home was fully erected. Judy marvels that the only waste left from the delivery exercise was one cardboard box and a stray plastic bag. She mulched the box. The couple asked for some variations which Modscape were more than happy to include as every Modscape project is bespoke and designed to suit a client’s unique site, spatial requirements and budget. Modscape has architects and interior designers in-house who worked collaboratively with Judy and Graeme to design and construct their dream home. Because the house is in dairy country—with its accompanying pesky flies—Judy requested three double-glazed sliding glass doors for the double-skinned north-facing wall of the living space, instead of a whole wall of glass. This meant the glass doors could be fitted with flywire screens. Delighted with this house and the fact that small-scale building is more friendly and rewarding than doing large-scale developments, Jan says they are equally happy to be pushed to find new solutions by clients who ask for sustainable and eco homes tailored to suit their needs. Judy lovingly calls the place her cave, but there’s no sense of spatial stinginess here. 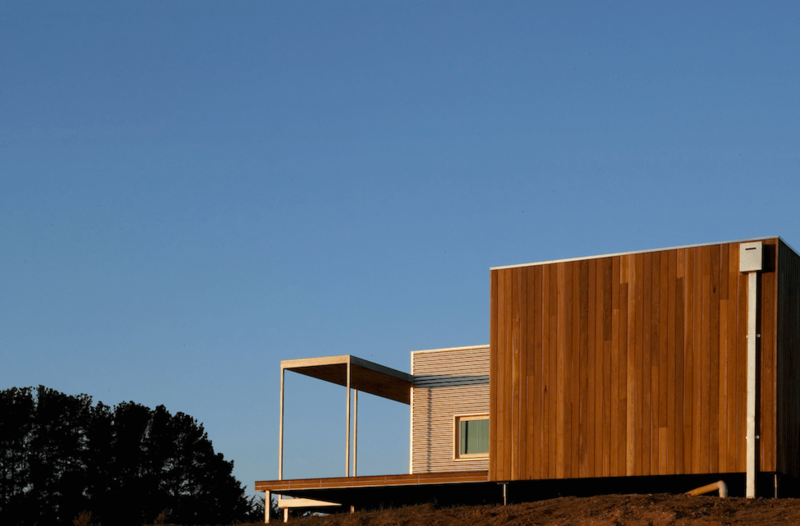 The home’s two interlinked modules are surrounded by wide expanses of spotted gum decking, which lead the eye out to the endless landscape and its distant horizons. This contained, cosy modular home gets through the depths of winter on the heat from a single combustion stove. Thoroughly considered site orientation, solar hot water, a Biolytic plumbing system for waste water, rainwater tanks and double glazed windows all support this thoughtful eco house design. There’s a strong sense of aesthetics at play here, too. The south-facing exterior of the home, for instance, features horizontal galvanised steel with vertical double-glazed windows. This is contrasted with the vertical spotted gum walls and horizontal windows of the guest wing. In time, the materials will weather to a muted, uniform greyness. “It will get better with age,” says Jan. If you would like to fulfil your dream of living a green life in a sustainable home, contact our consultants to discuss how a modular solution can work for you.